Bobe’s Cuernito Cookie Recipe – Que Ricas!!! 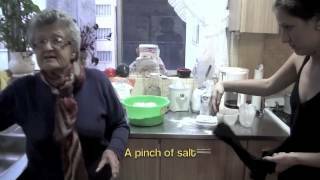 Alex and Anita went to Mexico City to learn and film a few of their Bobe’s (Grandma’s) recipes. Click on The picture of Bobe (above) to view the video of her and Anita in the kitchen. Follow the instructions in this 5 minute video to learn how to make these delicious cookies that are a family favorite! Keep in mind that in Mexico temperature is measured in Centigrade, which is why in the video Bobe says 200 degrees (392 degrees Farenheit). Bobe aslo mentions 1/2 kilo of margarine, which is 1.1 pounds of margarine, or a little over 4 sticks. Enlarge Courtesy Alex Schmidt Dora Schmidt prepares a batch of Cuernito butter walnut cookies. Dora Schmidt learned this recipe from a Mexican Jewish friend, originally from Poland, many years ago. The cookies are, however, traditionally served at Mexican weddings. Knead together walnuts, margarine (cut in pieces and room temperature), 5 cups of flour, sugar, vanilla and salt in a large bowl until all ingredients are combined and mixture is even. 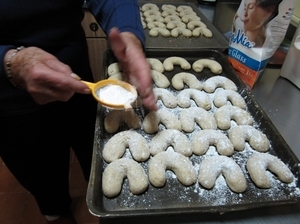 Take about 1-1/2 tablespoons of dough and roll it into a thick rope to form horseshoe or u-shaped cookies. Place cookies onto 2 baking pans sprayed with a small amount of cooking spray. Pre-heat oven to 400 degrees (about 200 Centigrade, as mentioned in the video). Bake cookies for 15 minutes. Cookies are done when they are no longer shiny, and have grown slightly. Do not allow to brown. Remove from oven and allow cookies to cool roughly 15 – 30 minutes (as they cool they will harden). Sprinkle confectioner’s sugar over the cookies (this is in addition to the sugar that goes into the dough mixture).